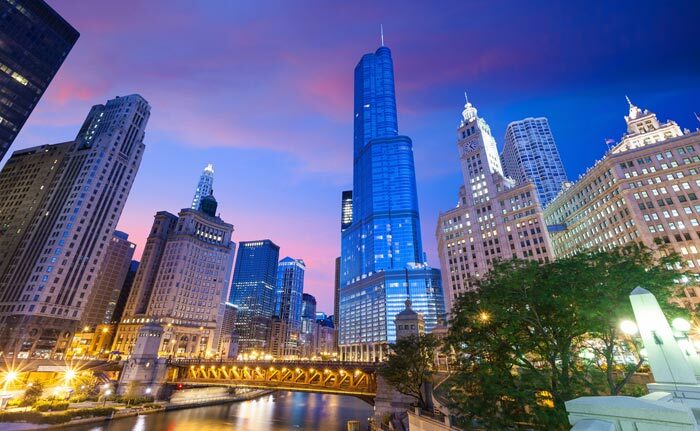 The USA’s third largest city, Chicago is a vibrant metropolis filled with striking architecture, renowned museums, fabulous shopping, and a huge variety of other attractions. It’s actually one of the most visited cities in the USA, providing something for everyone. Set on the shore of Lake Michigan, in north-east Illinois, the Windy City even has beaches that are popular during its hot summer months, while winters are cold and snowy. Even so, Chicago is a city you can visit at any time of the year as there’s always something happening here! 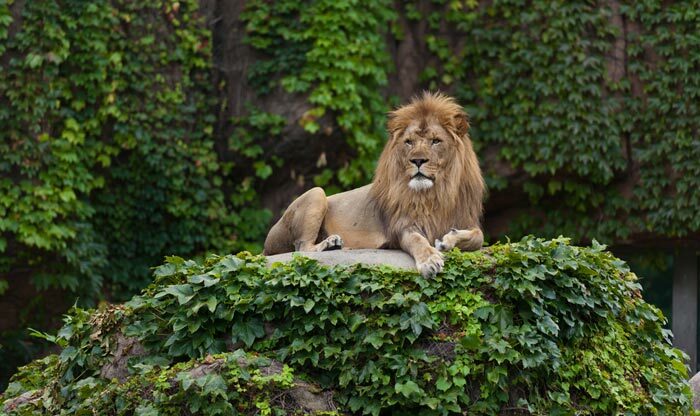 There are many reasons why Lincoln Park Zoo features on our top 10 things to do in Chicago and here are just a few: Opened in 1868 it is one of the oldest zoos in North America, and it’s one of only a few that do not charge admission. Obviously, the best thing about this zoo is the number of animals you’ll see; around 1100 from about 200 different species including many from around the world. Gorillas, polar bears, and penguins are among the most popular. Chicago is a multi-cultural city so you can find almost any type of world cuisine represented here, but when in Chicago, why not try some of the local specialties?! 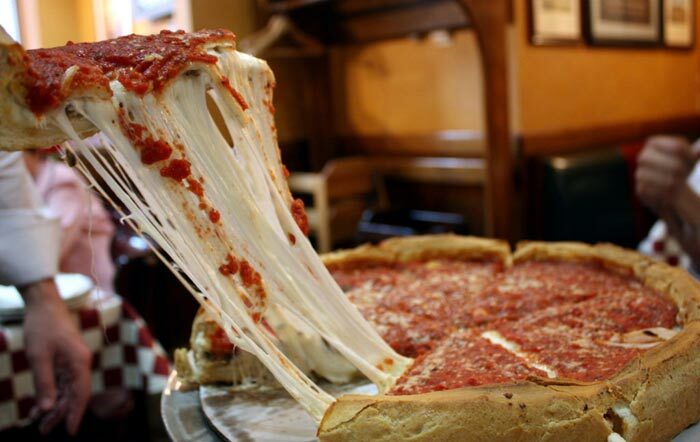 The most famous dish to come out of Chicago is the deep-dish pizza which, with its high edge, has plenty of space for loads of cheese, chunky tomato sauce and other toppings. But Chicago also makes great thin crust pizza too! The Chicago style hot dog is a great fast food staple, while some of the most popular sandwiches were influenced by Polish immigrants, such as the Maxwell Street Polish. 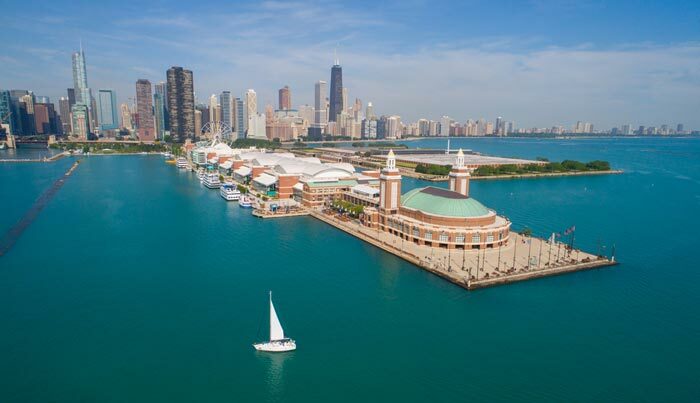 You could spend an entire day on Navy Pier as there’s so much to see and do in this one place. 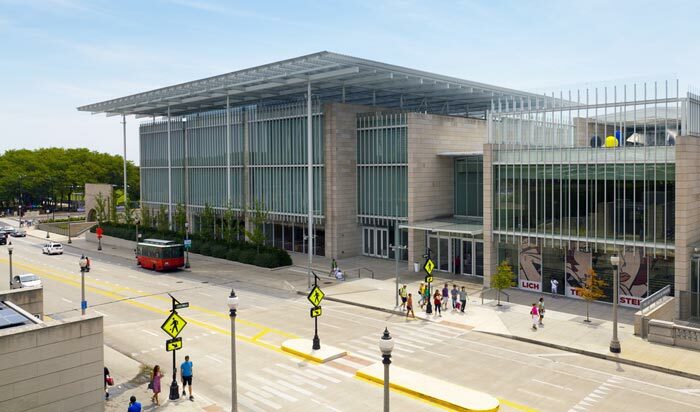 A great attraction to take your kids to, Navy Pier has something to please all ages of visitors from the large Ferris Wheel and other rides, to the Chicago Children’s Museum and Family Pavilion. There’s a theatre, places to eat, drink and shop, an IMAX Theatre, gardens, and more, plus many of the city’s boat tour companies depart from here whether you’re exploring the river or taking a dinner cruise. 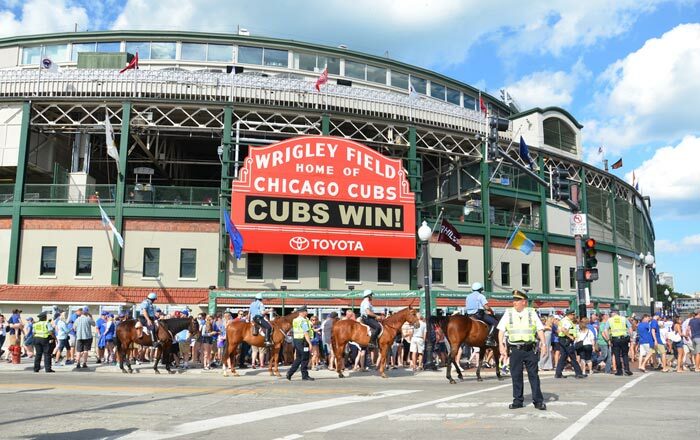 Being a baseball fan will add plenty of appeal to this Chicago attraction, but anyone with an interest in sports and history should enjoy a tour of Wrigley Field. 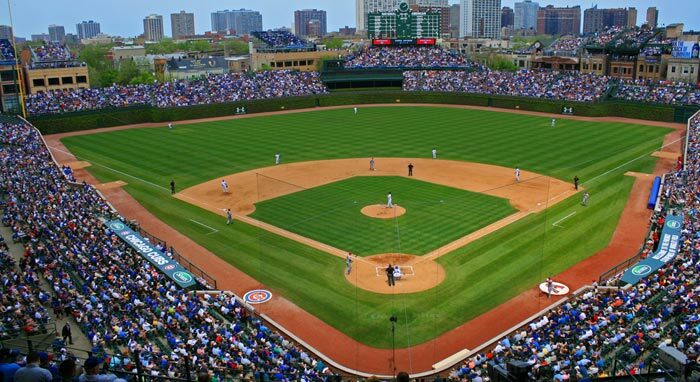 Opened in 1914 as Weeghman Park, it has been home to the legendary Chicago Cubs since 1916 and was renamed Wrigley Field (yes, after the chewing gum family) in 1927. Today, you can still watch the Cubs playing ball here; tickets are always in high demand, or when there isn’t a game take the guided tour to see some of the areas you wouldn’t otherwise get to see and hear about the history. 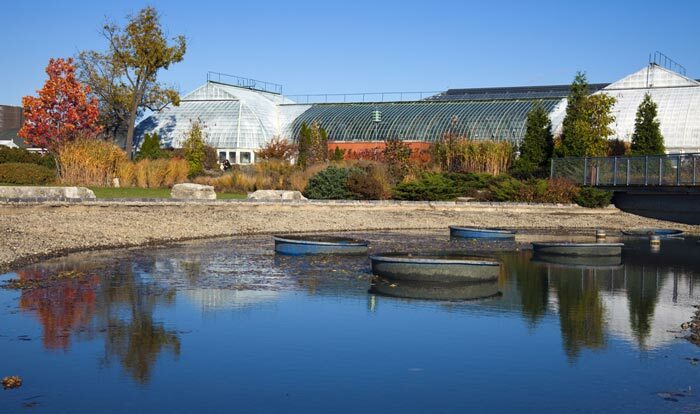 Even if flowers and gardens don’t usually appeal to you, be sure to add Garfield Park Conservatory to your list of what to do in Chicago as this place is amazing! 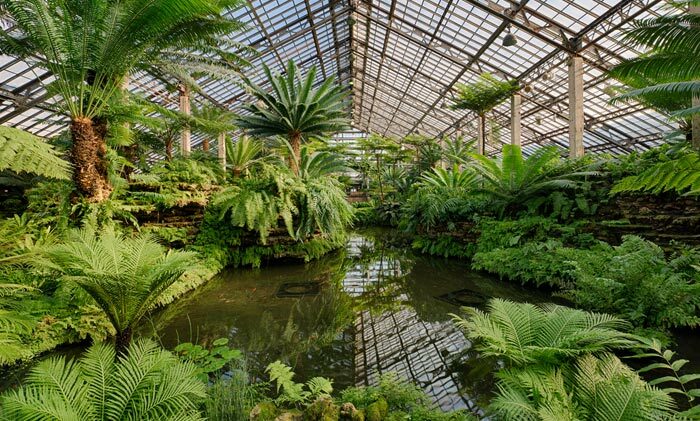 One of the largest greenhouse conservatories in the USA, it covers 4.5 acres within a building that was opened in 1908. You’ll see hundreds of different plants here, including many from around the world, and whatever the time of year outside you can enjoy lush green plants inside, such as those in the Fern Room or desert varieties in the Desert House. There’s even a kid’s play area if you’re visiting Chicago with children. The Chicago River defines the city almost as much as its skyline does. 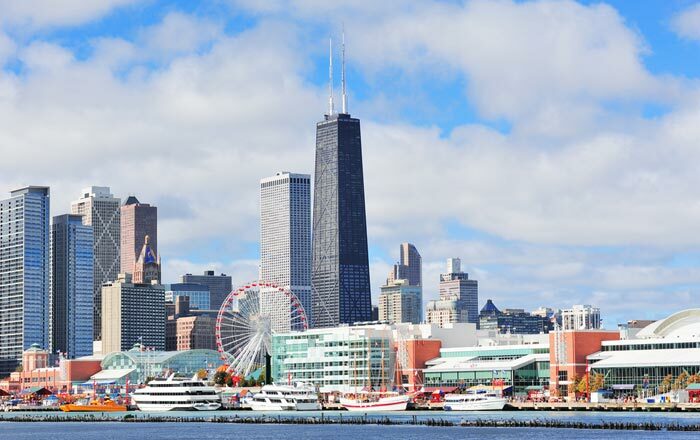 Slicing through the heart of Chicago, the river provides the perfect opportunity to get out on a boat and take a tour, seeing the city’s famous architecture from below, and seeing some buildings that you may have otherwise missed. 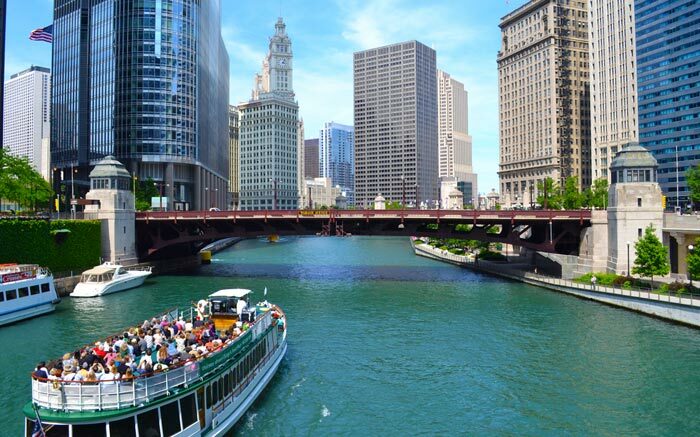 Guided boat tours are incredibly informative if you’re interested in all the different buildings and their history, which is why the river makes our list of top things to do in Chicago. Add the new Riverwalk to the mix and you have a great place to walk along the river or enjoy a meal or a drink in one of the cafes or restaurants. 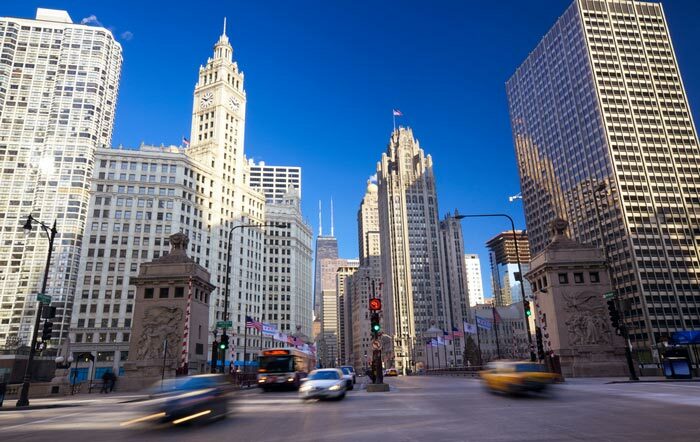 London has Oxford Street, New York has Fifth Avenue, and Chicago has the Magnificent Mile! This upscale section of Michigan Avenue is among the most expensive in the country for rent, and features some of the world’s best-known designer names. 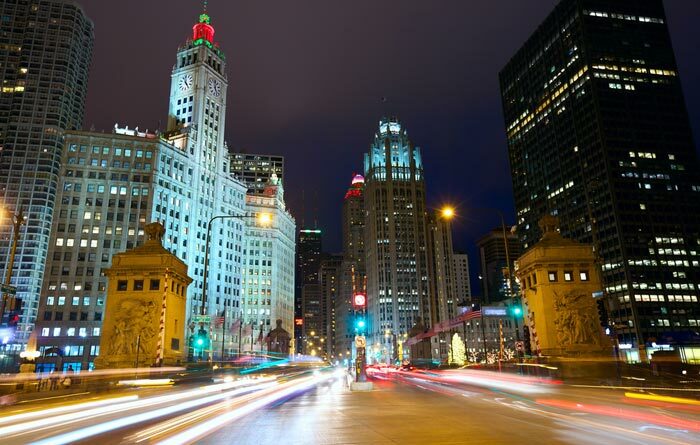 For mid- to high-end shopping, this is the place to come when in Chicago, but it’s also a fabulous destination for dining and is home to many different hotels and museums too. Whether you’re shopping or not, come walk along the Magnificent Mile and admire the architecture or just sit and people-watch in one of the many cafes. 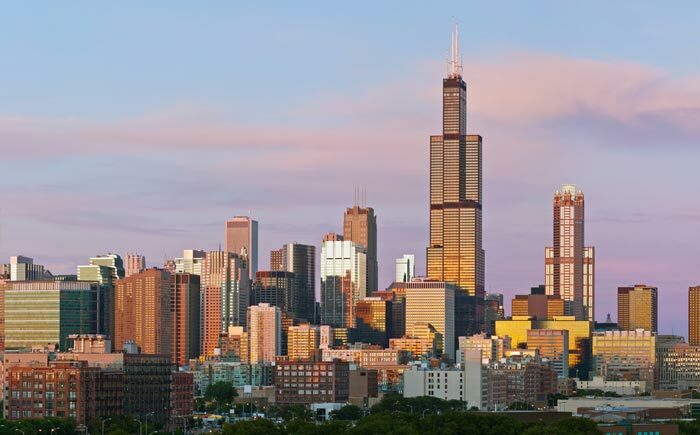 Built as the Sears Tower and completed in 1973, the second tallest building in the USA and tallest in the Western Hemisphere is a must-add to your list of what to do in Chicago. No trip to the Windy City is complete without seeing it from above, and the Skydeck observation deck is the best place to go. It’s the highest observation deck in the country, at a height of 412.4 meters (1353 feet), and you can even stand directly above the city streets and look down, thanks to the glass floor boxes that protrude from the building! 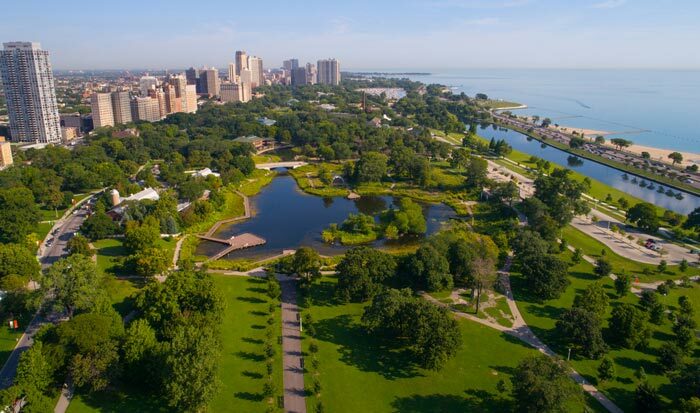 Chicago has a string of public parks along the shores of Lake Michigan, providing a nice buffer from all of the tall buildings. Of these, Millennium Park is the most popular, and the newest, having been added for the millennium, although it wasn’t completed until 2004! 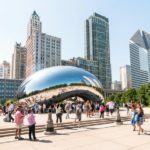 Now one of the top things to do in Chicago, Millennium Park is lots of different attractions in one but is best known for Cloud Gate and the centerpiece of the park, the Jay Pritzker Pavilion. 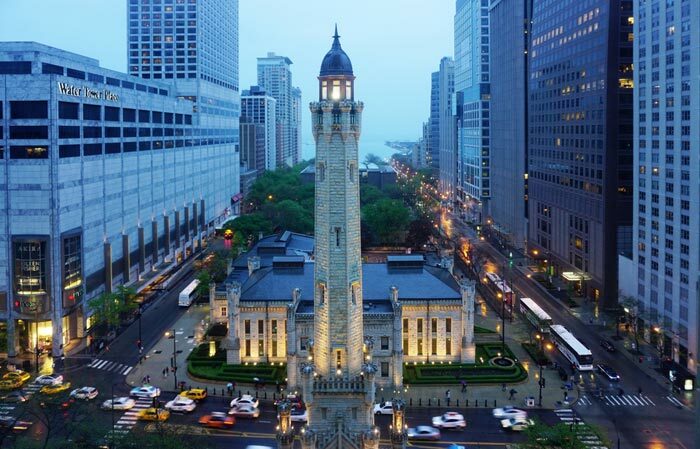 You won’t need to spend hours at this Chicago attraction, but it’s one not to be missed! 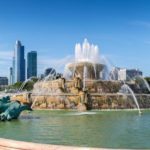 Chicago has a number of excellent museums, so this is a great city to visit if you enjoy culture and history. 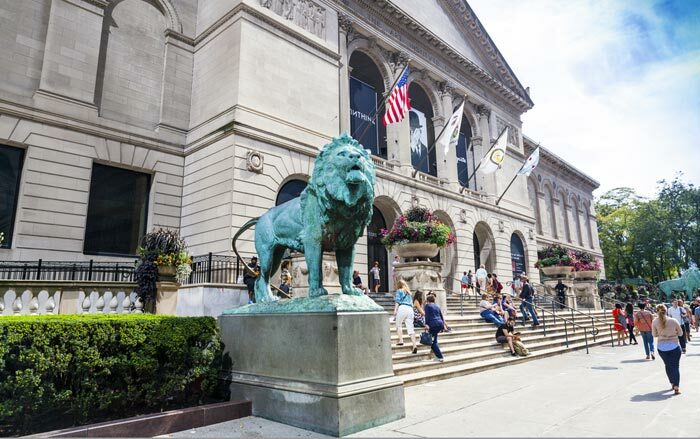 Among those, the best known, most-visited, and most highly-rated is the Art Institute of Chicago. Not only is this the top Chicago attraction, it is one of the most revered art museums in the world, featuring the best Impressionist collection of art outside of Paris, as well as a fabulous contemporary collection, and galleries devoted to the art of Asia, Africa, the America and ancient and Byzantine cultures. Don’t miss ‘Nighthawks’, or ‘A Sunday Afternoon on the Island of La Grande Jatte’.